CMS Non-Disclosure of Medical Errors Indicates Need for Change in how Healthcare Performance is Measured, Reported in U.S. Note from Chris: The following is a new article in its entirety that I wrote earlier this month, with my friend and colleague, Michael Wong, from the Physician-Patient Alliance for Health & Safety. The article is titled “CMS Non-Disclosure of Medical Errors Indicates Need for Change in how Healthcare Performance is Measured, Reported in U.S.” This article that Michael and I wrote together, was in response to an article that ran in USA Today titled “Feds stop public disclosure of many serious hospital errors” on August 6th regarding the Centers for Medicare and Medicaid Services (CMS) decision to completely remove important data on “hospital acquired conditions” (HACs) from their Hospital Compare website. The following are my true sentiments on this very important issue that I had posted on Facebook on August 15th. “I read this article in USA Today last week and it made me absolutely nauseous! In my opinion our government and in particular, the Centers for Medicare and Medicaid (CMS), are very quickly becoming a huge part of the problem, instead of the solution, to preventable medical errors that are senselessly claiming over 440,000 lives every year in the United States. Why would any government regulatory agency involved in patient safety want to stop disclosing ANY preventable medical errors to the public? Could it be that the government feels that “We the people”, can’t handle the real truth? By continually minimizing and “sugar coating” the real statistics and error reporting data that’s gathered, these organizations are actually perpetuating a “culture of denial” instead of positively changing the culture of medicine! If the federal government decided that the nation’s automakers were no longer required to publicly announce recalls of cars equipped with life-threatening defects, the protest from the masses would be deafening. Yet, a similar scenario is playing out now in the nation’s healthcare industry with relatively little public outcry. As recently reported in USA Today, the federal Centers for Medicare and Medicaid Services (CMS) has quietly stopped publicly reporting when hospitals make certain errors that threaten the lives of patients. This CMS decision is not only misguided, but it also points to an even more critical issue that exists in our healthcare system today: the need to address the mind-boggling variability in the quality and measures of healthcare provided across the nation. Currently, CMS, the Agency for Healthcare Research and Quality, the Joint Commission, the Leapfrog Group and the National Committee for Quality Assurance, as well as most states and for-profit companies, such as Healthgrades and U.S. News and World Report, all offer various – and frequently conflicting — performance measures, ratings, rankings and report cards. Meanwhile, hospitals are creating their own standards and posting their performance on their websites, often with little or no validation of their methodology or data. 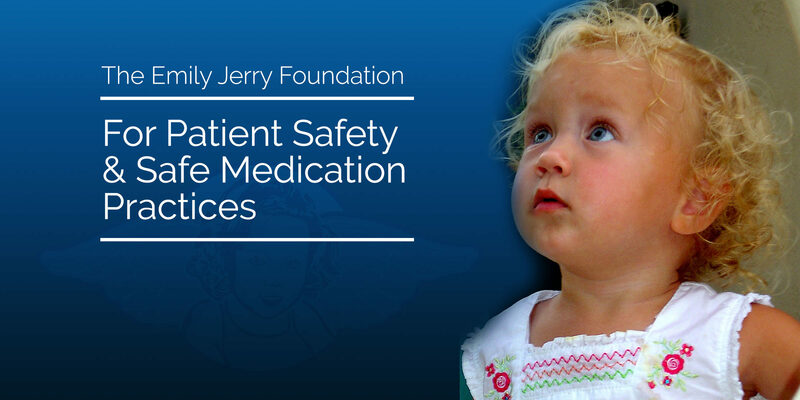 This quagmire of information is illustrated in the “2013 National Pharmacy Technician Regulation Scorecard” released by the Emily Jerry Foundation following the heartbreaking death of two-year-old Emily Jerry. It shows variation in training provided to pharmacy technicians. What all this means is that for patients and their loved ones today, choosing a physician or hospital based on publicly available information has become a daunting and confusing process. Ironically, even though a vast wealth of information is available to them, patients can’t make what could truly be described as informed decision about their care. How can this problem be solved? For certain, the CMS decision to stop publicly reporting information on life-threatening “hospital acquired conditions” (HACs) is not the answer. When hospitals make mistakes – like leaving foreign objects in patients’ bodies during operations or neglecting to continually monitor patients receiving potentially lethal opioid medication after surgery – the public deserves to be informed about those medical errors just as they are now informed about recalls of defective automobiles. Such information should not – and must not – be swept under the rug. With that thought in mind, it is imperative that all information and error data be truthfully and honestly disclosed to everyone involved, including the patients receiving medical care. If organizations like CMS, continue to limit and censor the data that is being shared with the public, then we as a society are perpetuating a “culture of denial” and mistrust in medicine, instead of positively affecting the underlying “culture of medicine” and how it is practiced. When this occurs, the public’s trust in modern day healthcare, unfortunately, gets seriously diminished. As a result, the public then loses sight of all the advancements that have been made in recent years, by everyone working together, on all levels, to find comprehensive solutions to preventable medical errors that tragically claim so many lives. By recent, very credible estimates, preventable medical errors are now the third leading cause of death in the United States, aside from cancer and heart disease. Unfortunately, preventable medical errors are now tragically claiming more than 440,000 lives in America every year (The Journal of Patient Safety “A New Evidence-based Estimate of Patient Harms Associated with Hospital Care”, September 2013 – Volume 9 – Issue 3 – p 122–128). By sighting these astounding numbers of preventable deaths that are occurring, the core objective is to stress the importance of transparently acknowledging the real problem at hand, as well as, the corresponding error data, as shocking as it may be. Subsequently, safeguards and solutions, that effectively save countless lives, can then be implemented as quickly as possible. These solutions should begin with creating policies that improve – and ultimately create universal standards – for measuring performance quality in our healthcare system. 7. Task a single entity with defining standards for measuring and reporting quality and cost data, similar to the role the Securities and Exchange Commission (SEC) serves for the reporting of corporate financial data, to improve the validity, comparability, and transparency of publicly-reported health care quality data. Of these recommendations, the last is a game-changer. Creating an entity to serve as the healthcare industry’s equivalent of the SEC would provide patients – who are now forced to swim against seemingly endless waves of competing and often contradictory information – a single source of quality data that has a national consensus behind it. Should there be an SEC for healthcare? Although this concept will no doubt stir debate, no one can argue that our current systems for measuring performance quality are flawless. What’s also undeniable is that beyond creating national policies that improve performance reporting – including consistent and accurate information about life-threatening medical mistakes– our nation’s healthcare system needs to take greater steps to prevent those mistakes from happening in the first place. Fortunately, significant progress on that front is already underway — with myriad action plans and initiatives developed by patient safety experts and advocates groups across the nation, such as these recommendations and this checklist from the Physician-Patient Alliance for Health & Safety. With national protocols in place to prevent medical errors from occurring – and accurately measuring and reporting them when they do — the lives and safety of literally thousands of patients could be protected each year. * You can view this article where it was originally published on the Physician-Patient Alliance for Health & Safety website by clicking here. The Emily Jerry Foundation is determined to help make our nation’s, world renowned, medical facilities safer for everyone, beginning with our babies and children. We are accomplishing this very important objective by focusing on increasing public awareness of key patient safety related issues and identifying technology and best practices that are proven to minimize the “human error” component of medicine. Through our ongoing efforts The Emily Jerry Foundation is working hard to save lives every day. Pharmacy Technicians University Now Available for Individuals!